A land of mystery brimming with history. 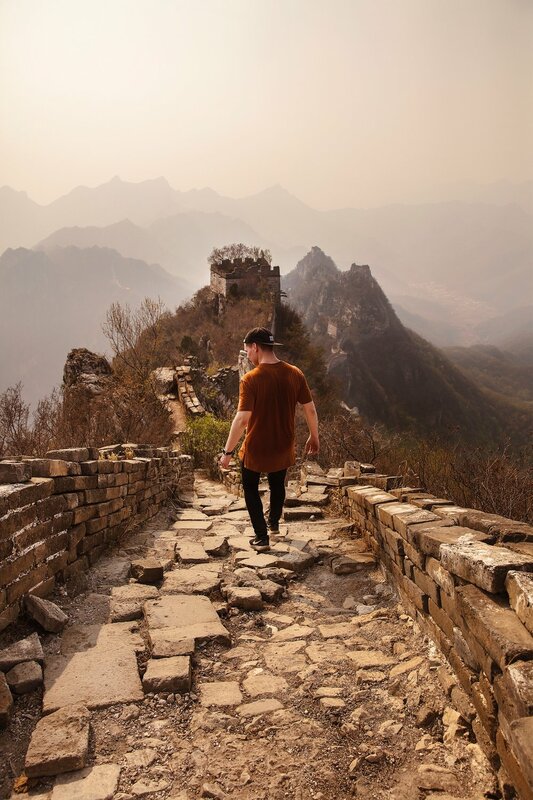 When you think of China, famous landmarks like The Forbidden City and The Great Wall of China are bound to spring to mind. And these sites should absolutely be on your bucket list, but don’t limit yourself! China has so much MORE to offer! With a diverse landscape this country has an infinite number of spectacular sites, from mountain ranges to beaches, city skylines to traditional water towns, it’s surprisingly still uncharted territory for Instagram influencers. Prepare to be inspired. Situated within the Zhangye Danxia Landform Geological Park, this mountain range is one of the most magical rock formations you’ll ever see. 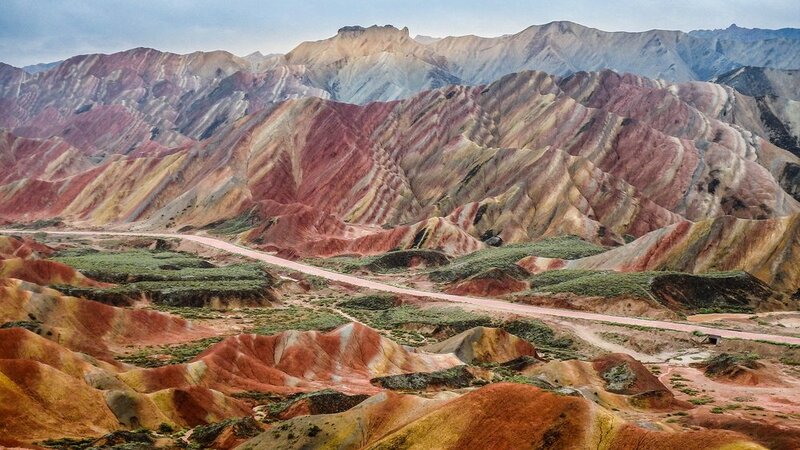 Predominantly made of red sandstone (hence why it is frequently referred to as China’s Grand Canyon), different minerals and years of erosion has added a rainbow effect of colour which, although not quite as a vividly saturated as often depicted in photos, is still vibrant enough to be considered one of the Seven Most Stunning Natural Wonders of Asia by National Geographic. 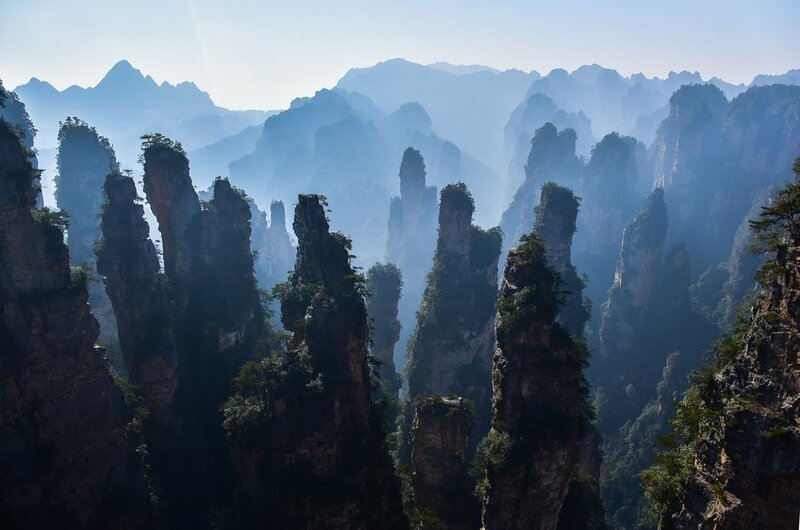 A unique World Heritage Site, Zhangjiajie is distinguished by its towering rocky pillars covered in foliage. What is more, thanks to the world’s tallest outdoor elevator, a view from above across the national park is easily accessible to all visitors. While you’re at it, fancy a stroll along the longest and highest glass bridge in the world, spanning the width of the canyon? What is it about rice terraces that is so mesmerising? The undulating pools follow the curve of the Ailao mountains perfectly, with the motionless water casting captivating reflections, all the way down to the banks of the Red River. You’ll be astonished by the sheer vastness of these handmade masterpieces. For the best photos visit the Duoyishu Rice Terraces at sunrise or Laohuzui Rice Terraces for sunset! At 71m tall, this statue carved into a cliff is the largest Buddha statue in the world! Placed to overlook the mountain opposite, with a river flowing past its feet, it took over 90 years to complete and was originally built to calm the tempestuous river below. Marvel at this colossal statue and appreciate the engenuity of the workers who finished building this over a century ago, in 803. The highlight of the Li River is the Yellow Cloth Shoal, where the water is still and reflects the surrounding peaks known as the 'Seven Fairy Maidens Descending to the World'. Take a bamboo raft so you’ll be able to take in the scenery and capture its beauty in your own time, this is a site where you will not want to be rushed. What is more instagrammable than one of the Seven Wonders of the World?? Parts of this wall were built as early as the 7th Century BC, but the majority of the wall that still stands today has been rebuilt over several dynasties. This iconic site is not only of historical significance, it is breathtaking aesthetically too. On a clear day you can see the wall winding along the horizon for miles around. A valley filled with calcified pools and encompassed by dense evergreen forests, this photogenic site is best appreciated in Summer and Autumn, as the valley is often closed for maintenance in the winter, and in the spring the park in low on water. It is the turquoise water that makes it stunning, so picking the right time of year to visit is essential! 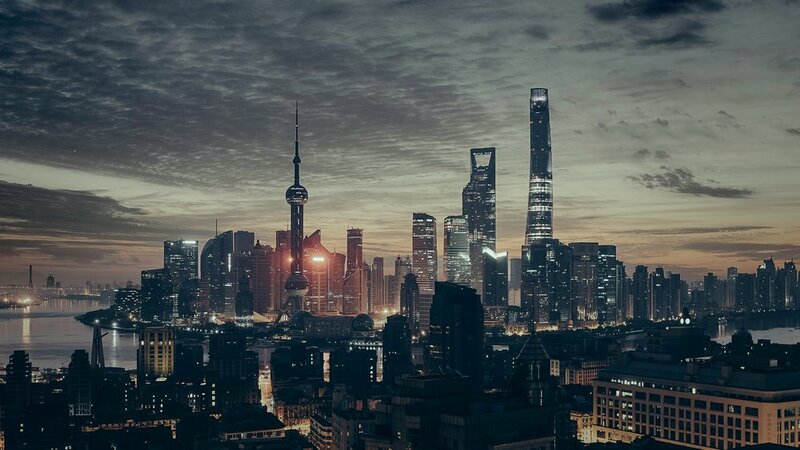 This dynamic city has one of the most photogenic skylines in the world, with the distinctive Oriental Pearl TV Tower setting it apart from other cities. Get a waterfront photo, with the river in front of the tower you can easily frame both in shot for the perfect Instagram post. Tempted yet? The Himalayas pass through several countries, including India, Pakistan, Nepal and, of course, China! Is there anything more impressive on your Instagram feed than the World’s highest mountain? Mt. Everest towers at 8,848m, but to get to it you have to travel with a tour company, as Tibet does not allow individual foreigners through. For an outstanding view of the mountain range, go to Geu La Pass, which at 5,200m altitude is the same height as the Everest base camp. From this viewpoint you’ll be able to see clearly (weather permitting) the five peaks above 8,000m. 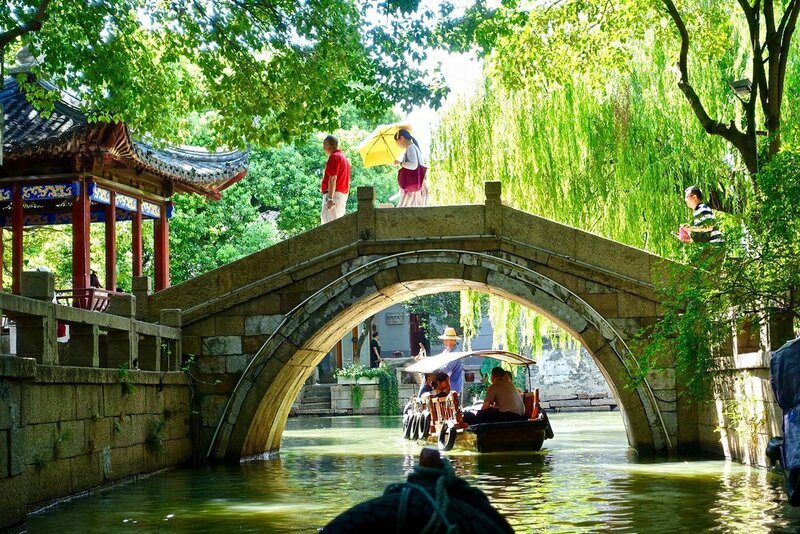 A quiet and ancient water town, well suited to lovers of photography and architecture. Due to the canals seamlessly integrated into the town, it’s been dubbed the ‘Oriental Venice’. With the river as an integral feature to the town, you won’t be surprised that it is also known for its bridges. Okay, now who wants to go to China?? Written by Jade Touron, follow her adventures on Instagram.